The name of "Tickner", in its variant phonetic forms, has been around for centuries and in its modern form is perpetuated in Normandy on Ordnance Survey maps as "Tickners Bridge" (Grid reference SU936518 refers), as discussed in the article on Tickners Bridge. Strangely, there is no historical family record of a Tickner family in Normandy. There is knowledge of a relatively modern family of that name having lived at Perry Hill Worplesdon. The supposition (in the absence of documentary evidence to prove otherwise), is that the name Tickner and its association with Normandy is no more than a locality name, albeit that until 1962 Tickners Bridge remained an important parish boundary marker between Worplesdon and Normandy. The 1844 Normandy Tithe map, for example, shows clearly the Y division of Tickners Bridge Road (now the Guildford Road - the A323) at Anchor Close, the site of the former Anchor Public House (origin about 1613) but regrettably demolished in 2000. The pub was the hub of early Normandy. At this point, the map shows the Guildford Road from the direction of Ash split into two ways. The A323 continues towards Willey Green corner as at present, but the "minor way" peels-off to the right and recently has been named Wells Lane. In 1844 Wells Lane would have been little more than a cart track giving access to "Pritchells" (a mid 15th Century cottage) and "Mintners" (an equally old cottage) now named "Old Cottage". The lane remains un-made and is probably in no better condition now than it was in 1844 when it gave access southwards to Flexford and Wanborough. There were a number of named fields around that junction, two of which were Tickners Field and Tickners Moor. Moreover, the Cleygate Manorial Records also revealed references to ancient named fields in that area. They had a remarkable phonetic similarity to that Saxon or old English word "Titnes". The earliest mention in 1485 was with reference to Tittemershe and Liteltitmershe leased to Robert Raunce. There follows Long Tytnes	and Little Titnes let in 1548 by Edward IV to Gregory Levett, Tytnes Mead (1580) and Long Tiknors (1687). It was in the mid 1800s that the farmhouse (by now familiarly known as 'Tickners'), was converted into four dwellings and the outbuildings, fronting Bailes Lane, were converted into two dwellings. Later in about 1870, two houses were built close-by on the farm land and the eight cottages were collectively named New Cut Cottages. In 1965, the outbuildings fronting Bailes Lane were demolished and replaced by six new houses. 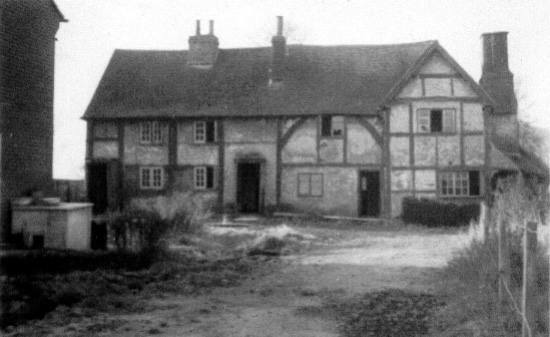 The old farmhouse remained occupied until the last tenant was re-housed at Walden Cottages in 1957, following which the old farmhouse was demolished. The two houses built in 1870 remain and until quite recently were known as 1 & 2 New Cut Cottages. 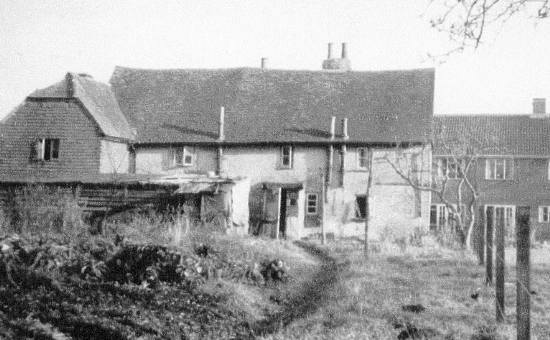 This poor quality photograph of the farmhouse, taken just before its demolition in 1957, gives insufficient information to be sure of its age. However, the arching braces of the main range suggested a medieval date of about 1550 (in building terms), but the eaves being relatively high, indicated that a build date towards the end of that period was more probable. Certainly the originality of the building looked the "pre-chimney" period. The arrangement of the main bay posts was deemed to be unusual, as was the half-bay at the left-hand end. The gabled form would normally be post medieval and it may be that this end was added, and the roof form changed. The right-hand end appears to be later, probably 17th Century since it has small panel framing. Following its demolition it was noted that the foundation for the base brickwork was composed of local stone and some irregular stone and flint.